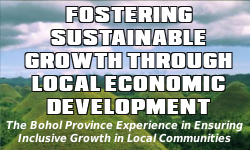 This plan is a joint undertaking between the Province of Bohol through the Provincial Planning & Development Office (PPDO), the Bohol Environment Management Office, the Bohol Tourism Office and the German Development Service (DED), Inwent, UNDP-GEF-SGF through DENR & DOT. The formulation of this document is a significant and highly relevant initiative for a province that distinguishes itself as a top tourist destination with its wide array of ecological wonders and richness of flora and fauna both in the terrestrial and underwater environments. This framework plan is likewise a local landmark response to the National Eco-tourism Strategy (NES) and Program of the Philippine Government as expressed in Executive Order 111 that establishes the guidelines for eco-tourism development in the country. It rests upon the policy of the state to ensure the sustainable use, development, management, protection, and conservation of the country’s environment and natural resources and cultural heritage for the enjoyment of the present and future generations. It is worthy to note that the Province of Bohol has been privileged to host the First National Eco-tourism Congress in 1999 where eco-tourism and its role in sustainable development of natural and cultural resources were defined. 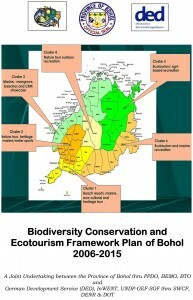 More so, Bohol has been identified as one of the key sites that became the focus of concerted efforts to develop eco-tourism in the country, which were selected based on established criteria under the NES. To some extent, non-government organizations (NGOs) have initiated the development of community-based eco-tourism destinations in the province that have now started to establish their market niches such as the dolphin and whale-watching tour in Pamilacan Island (Baclayon), the Cambuhat River and Village Tour in Buenavista, the Candijay Mangrove Adventure Tour or the variety of adventure tours in Rajah Sikatuna National Park. More and more projects have come about in other municipalities as the economic and conservation-enabling benefits of eco-tourism enterprises have surfaced to the fore and each area teems with potential and prospects as an attraction. This is in addition to the Boholanos inherent cultural trait and pride to welcome visitors with warmth and hospitality. Definitely, municipal local government units and the private sector, most importantly the investor will greatly benefit from this endeavor. This framework plan is likewise a local landmark response to the National Eco-tourism Strategy (NES) and Program of the Philippine Government as expressed in Executive Order 111 that establishes the guidelines for eco-tourism development in the country. It rests upon the policy of the state to ensure the sustainable use, development, management, protection, and conservation of the countrys environment and natural resources and cultural heritage for the enjoyment of the present and future generations. No wonder why Bohol is in the tourism map. Thanks for the inspiration.